The land that is present-day Oklahoma was first settled by prehistoric American Indians including the Clovis 11500 BCE, Folsom 10600 BCE and Plainview 10000 BCE cultures. Historic indigenous peoples who inhabited the region included the Wichita and Caddo peoples. In the 16th century, Spanish explorer Francisco Vásquez de Coronado visited in 1541, beginning European contact. Around the 1700s, two tribes from the north, the Comanches and Kiowas, migrated to the Oklahoma and Texas region. For most of the 18th century, the Oklahoma region was under nominal French control as Louisiana. The limited interaction between the peoples was based on fur trading. In 1803, the Louisiana Purchase by Thomas Jefferson brought the area under United States control. In 1830, Congress passed the Indian Removal Act, which removed American Indian tribes from the Southeast and relocated them to Indian Territory west of the Mississippi River. The southern part of this territory was originally assigned to the Choctaw and Chickasaw. In 1867, the United States used the Medicine Lodge Treaty to allot the southwest portion of the Choctaw and Chickasaw’s lands to the Comanche, Kiowa, and Apache tribes. Fort Sill was established in 1869 after the American Civil War by Major General Philip Sheridan, who was leading a campaign in the Indian Territory to stop raids into Texas by American Indian tribes. In 1874, the Red River War broke out in the region when the Comanche, Kiowa, and Southern Cheyenne left their Indian Territory reservation. Attrition and skirmishes by the US Army finally forced the return of the tribes back to Indian Territory in June 1875. In 1891, the United States Congress appointed a commission to meet with the tribal leaders and come to an agreement allowing white settlement. Years of controversy and legal maneuvering ensued before President William McKinley issued a proclamation on 4 July 1901, that gave the federal government control over 2,000,000 acres (8,100 km2) of surplus Indian land. Under other legislation, the United States through the Dawes Commission allotted communal lands as plots to individual households of tribal members, selling off what remained as "surplus". These actions extinguished the tribal claims to communal lands, a condition needed for the admission of Oklahoma as a state in 1907. After these changes, the legislature of the new state began to organize counties. Three 320-acre sites in Kiowa, Caddo and Comanche counties were selected for county seats, with Lawton designated as the Comanche County seat. 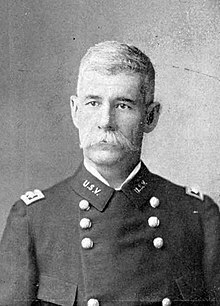 The town was named for Major General Henry W. Lawton, a quartermaster at Fort Sill, who had taken part in the pursuit and capture of Geronimo. The city was opened to settlement through an auction of town lots beginning on 6 August 1901, which was completed 60 days later. By 25 September 1901, the Rock Island Railroad expanded to Lawton and was soon joined by the Frisco Line. The first city elections were held 24 October 1901. The United States' entry into World War I accelerated growth at Fort Sill and Lawton. The availability of 5 million US gallons (19,000 m3) of water from Lake Lawtonka, just north of Fort Sill, was a catalyst for the War Department to establish a major cantonment named Camp Doniphan, which was active until 1922. Following World War II, Lawton enjoyed steady population growth, with the population increasing from 18,055 to 34,757 from 1940 to 1950. By the 1960s, it had reached 61,697. In the postwar period, Lawton underwent tremendous growth during the late 1940s and 1950s, leading city officials to seek additional water sources to supplement existing water from Lake Lawtonka. In the late 1950s, the city purchased large parcels of land along East Cache Creek in northern Comanche County for the construction of a man-made lake with a dam built in 1959 on the creek just north of U.S. 277 west of Elgin. Lake Ellsworth, named for a former Lawton mayor, soft-drink bottler C.R. Ellsworth, was dedicated in the early 1960s. It offered additional water resources, but also recreational opportunities and flood control along Cache Creek. In 1966, the Lawton City Council annexed several miles of land on the city's east, northeast, west, and northwest borders, expanding east beyond the East Cache Creek area and west to 82nd Street. On 1 March 1964, the north section of the H. E. Bailey Turnpike was completed, connecting Lawton directly to Oklahoma City, the capital. The south section of the turnpike leading to the Texas border was completed on April 23, 1964. Urban renewal efforts in the 1970s transformed downtown Lawton. A number of buildings dating to the city's founding were demolished to build an enclosed shopping mall. On 23 June 1998, the city expanded when Lawton annexed neighboring Fort Sill. With the advent of the Base Realignment and Closure of 2005 increasing the size of Fort Sill, Lawton is expected to see continued population and economic growth over the course of the next 20 years. Lawton is the fifth largest city in Oklahoma, located at 34°36′16″N 98°23′45″W﻿ / ﻿34.60444°N 98.39583°W﻿ / 34.60444; -98.39583 (34.604444 N, 98.395833 W). The city has a total area of 75.1 sq mi (195 km2), all land. Lawton is located approximately 84 mi (135 km) southwest of Oklahoma City. Other surrounding cities include Wichita Falls about 47 mi (76 km) to the south, Duncan about 33 mi (53 km) to the east, and Altus about 56 mi (90 km) to the west. Lawton lies in an area typical of the Great Plains, with prairie, few trees, and flat topography with gently rolling hills. The region north of the city consists of the Wichita Mountains, including Mount Scott and Mount Pinchot, the area's highest peaks. The area consists mostly of Permian Post Oak Conglomerate limestone on the northern sections of the city. In the south sections of the city, Permian Garber sandstone is commonly found with some Hennessey Group shale. Area creeks including East Cache Creek contain deposits of Quaternary alluvium. To the northwest, the Wichita Mountains consist primarily of Wichita Granite Group from the Cambrian era. Lawton lies in a dry subtropical climate (Köppen climate classification Cfa), with frequent variations in weather daily, except during the constantly hot and dry summer months. Frequent strong winds, usually from the south or south-southeast during the summer, help to lessen the hotter weather. Northerly winds during the winter can occasionally intensify cold periods. Lawton is located squarely in the area known as Tornado Alley and is prone to severe weather from late April through early June. Most notably, an F4 tornado in 1957, and an F3 tornado in 1979 struck the southern region of the city. Lawton is primarily centered on government, manufacturing, and retail trade industries. Lawton MSA ranks fourth in Oklahoma with a gross domestic product of $4.2 billion produced in 2008, with a majority ($2.1 billion) in the government sector. Fort Sill is the largest employer in Lawton, with over 5,000 full-time employees. In the private sector, the largest employer is Goodyear Tire and Rubber Company with 2,400 full-time employees. Major employers in the Lawton area also include: Lawton Public Schools, Comanche County Memorial Hospital, City of Lawton, and Cameron University. Lawton includes two major industrial parks. One is located in the southwest region of town, while the second is located near the Lawton-Fort Sill Regional Airport. Lawton is home to many annual attractions, including the Prince of Peace Easter passion play held in the Holy City in the Wichita Mountain Refuge each year on Palm Sunday, continuing to Easter Eve. It continues to be one of the longest-running Easter passion plays in the nation and was the basis for the 1949 movie The Prince of Peace. The passion play was also featured in a documentary called Jesus Town, USA which focuses on a new actor portraying the role of Jesus after the former actor of 8 years retired from the role. The documentary is light-hearted and amusing, but turns slightly serious when he announces to the camera that he had become a Buddhist. He struggles with the decision to tell his fellow castmates and family about his rejection of the Christian church. Many folks are upset about his decision, but he is allowed to continue in the role of Jesus despite his faith. Lawton has three public museums. The Museum of the Great Plains is dedicated to natural history and early settlement of the Great Plains. Outdoor exhibits include a replica of the Red River Trading Post, the original Blue Beaver schoolhouse, and Elgin Train Depot with a Frisco locomotive. The Fort Sill Museum, located on the military base of the same name, includes the old Fort Sill corral and several period buildings, including the old post guardhouse, chapel, and barracks, as well as several artillery pieces. The old fort is also designated as a National Historic Landmark. The Comanche National Museum and Cultural Center, operated by the Comanche Nation Tribe, focuses on exhibits and art relating to the Comanche culture past and present. The museum also hosts traveling American Indian exhibitions from the Smithsonian Institution, Michigan State University Museum, and Chicago's Field Museum. Lawton is home to Cameron University, which is a NCAA Division II school in the Lone Star Conference. Noted for winning the NAIA Football National Championship in 1987, the school currently does not have a football program. However, Cameron remains competitive in 10 varsity sports, including Men's and Women's Basketball, Baseball, and Softball. Lawton was the former home to the Lawton-Fort Sill Cavalry. The Cavalry moved in 2007 from Oklahoma City to Lawton, where they won two Continental Basketball Association championships and a Premier Basketball League championship. In 2011, the Cavalry ceased operations in their second year in the PBL. Lawton is home to 80 parks and recreation areas in varying sizes, including the largest Elmer Thomas Park. Along with the park system, the city is near three major lakes, Lake Lawtonka, Lake Ellsworth, and Elmer Thomas Lake, where boating, swimming, camping, and fishing are permitted. The Lawton branch of the Young Men's Christian Association (YMCA) offers a wide variety of recreational programs to members, and the Lawton Country Club maintains an 18 hole, par 71 golf course. Recreation can also be found in many amateur leagues, including: adult softball, youth baseball, soccer, softball, and volleyball. Northwest of the city is the Wichita Mountains Wildlife Refuge, managed by the US Fish and Wildlife Service to preserve the natural fauna of southwest Oklahoma. The refuge includes a Visitor Center, several camping areas, hiking trails, and many lakes for the public to explore. Lawton uses the council-manager model of municipal government. The city's primary authority resides in the City Council, which approves ordinances, resolutions, and contracts. The city is divided into eight wards, with each ward electing a single city council representative for a three-year term. The mayor, who is elected every three years, presides and sets the agenda of the City Council, but is primarily ceremonial as a head of government. The administrative day-to-day operation of the city is headed by the City Manager, who is appointed by the City Council. As of August 2016, the Mayor of Lawton was Fred L. Fitch. As of July 2015, the City Manager was Gerald (Jerry) S. Ihler. Lawton is the county seat of Comanche County, and houses county offices and courts. Three elected commissioners serving four-year terms manage the county government. At the federal level, Lawton lies in Oklahoma 4th Congressional District, represented by Tom Cole. In the State Senate, Lawton is in District 31 (Chris Kidd) and 32 (John Michael Montgomery). In the House, District 62 (Daniel Pae), 63 (Trey Caldwell), and 64 (Rande Worthen) cover the city. 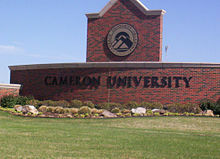 Cameron University is the largest four-year, state-funded university in southwest Oklahoma, offering more than 50 degree programs in areas of Business, Education, Liberal Arts, and Science and Technology. Founded in 1909, Cameron has an average fall enrollment of 6,000 students with 70 endowed faculty positions. Other colleges in Lawton include Comanche Nation College. Founded in 2004, the college provides lower-division programs and educational opportunities in higher education for the Comanche Nation and the public. Lawton is also served by the Great Plains Technology Center, which is part of the Oklahoma Department of Career and Technology Education system. Great Plains provides occupational education, training, and development opportunities to area residents. Lawton Public Schools serves most of the city of Lawton. The district operates two prekindergarten centers, 24 elementary schools, four middle schools, and three high schools – Eisenhower, Lawton, and MacArthur. In 2008, Lawton Public Schools had an enrollment of about 16,000 students with about 1,000 teachers. Two independent districts, Bishop and Flower Mound, serve portions of Lawton. Bishop operates a single PK–6 elementary campus and Flower Mound has a PK–8 campus. Secondary students living in these districts attend Lawton Public Schools. A small portion of far-west Lawton is served by Cache Public Schools. The Lawton Constitution, the only daily newspaper published in Lawton, has a circulation of 30,000. In addition, the Fort Sill newspaper, The Cannoneer, is published weekly primarily for military personnel, as well as the newspaper The Cameron Collegian, whose main audience is Cameron University students. Additionally, Okie Magazine is a monthly magazine that focuses on news and entertainment in the Southwest Oklahoma area. Radio stations in Lawton include two AM stations – CBS Sports Radio affiliate KKRX (1380) and urban adult contemporary station KXCA (1050) – and 15 FM stations – including NPR member KCCU (89.3), country stations KFXI (92.1) and KLAW (101.3), rock music station KZCD (94.1), Hot AC station KMGZ (95.3), urban contemporary outlet KJMZ (97.9), and CHR station KVRW (107.3). Lawton is part of a bi-state media market that also includes the nearby, larger city of Wichita Falls, Texas; the market, which encompasses six counties in southwestern Oklahoma and ten counties in western north Texas, has 152,950 households with at least one television set, making it the 148th-largest in the nation as of the 2016–2017 season, according to Nielsen Media Research. KSWO-TV (channel 7), an ABC affiliate (which also carries affiliations with MeTV and Telemundo on digital subchannels), is the only broadcast television station in the market that is licensed to Lawton, and its local news programming maintains a primary focus on southwestern Oklahoma in its coverage. All other major stations in the area, including KFDX-TV (channel 3; NBC), KAUZ-TV (channel 6; CBS, which is a sister station to KSWO through a shared services agreement but maintains separate operations on the Texas side of the market), and KJTL (channel 18; Fox), are based in Wichita Falls. Lawton is primarily served by Interstate 44, designated as the H. E. Bailey Turnpike. It connects the city to Oklahoma City to the northeast and to Wichita Falls, Texas, to the south. The city is also connected by US Highway 62, which connects to the regional towns of Altus to the west and Anadarko to the north. Other major thoroughfares include US Highway 277 and 281, which parallels the H. E. Bailey Turnpike to Wichita Falls to the south and leads to regional towns of Anadarko and Chickasha, respectively, to the north, and OK-7, which connects Lawton to Duncan. By air, Lawton is served by the Lawton-Fort Sill Regional Airport (LAW, KLAW). At present, it offers daily American Eagle flights to Dallas/Fort Worth International Airport, and is also used for military transport. Lawton has three major hospitals in the area. The largest, Comanche County Memorial Hospital, is a 283-bed nonprofit hospital that employs 250 physicians. Southwestern Medical Center is a 199-bed hospital with a staff of 150 physicians. In addition, the U.S. Public Health Lawton Indian Hospital is located in the city to provide health services for the large American Indian population. It has 26 beds with a staff of 23 physicians. Notable musicians from Lawton include country singers Bryan White, Kelly Willis, and Leon Russell, Sissy Brown, and Grammy nominated jazz trombonist Conrad Herwig. Notable authors include Pulitzer Prize-winning author N. Scott Momaday, poet Don Blanding, Hugo Award-winning science fiction writer C. J. Cherryh and Christian fiction author Cheryl Wolverton. The late SpongeBob SquarePants creator Stephen Hillenburg was also born in Lawton. Among the prominent political leaders from Lawton are: US Senator Thomas Gore, US Representatives Scott Ferris, L. M. Gensman, Elmer Thomas, Speaker of the Oklahoma House of Representatives T.W. Shannon, Democratic State Senator Randy Bass and former US Ambassador to Czechoslovakia Julian Niemczyk (born on Fort Sill). Oklahoma State Supreme Court Justice Fletcher Riley came to Lawton with his parents in 1901 and resided there until going to Oklahoma University in 1916. Gregory A. Miller, an attorney and a Republican member of the Louisiana House of Representatives from St. Charles Parish, was born at Fort Sill in 1962, where his father, Ralph R. Miller, was stationed. Ralph Miller was a state representative from St. Charles Parish from 1968 to 1980 and 1982 to 1992. Other notable Lawton residents include World War II Comanche code talker Charles Chibitty, Academy Award-winning actress Joan Crawford, WWII ace Robert S. Johnson, actor Paul Sparks, Jesse Dalton from Dalton Gang Outdoors, television personality and producer Paul Harrop, three-time NBA champion Stacey King, former NBA All-Star Michael Ray Richardson, Miss America 2007 Lauren Nelson, infamous University of Oklahoma quarterback Charles Thompson, NFL Pro Bowlers Will Shields and Jammal Brown, 2006 contender, champion boxer Grady Brewer, Buffalo Bisons manager and former MLB infielder Marty Brown, former MLB catcher Tom Jordan, and IFBB professional bodybuilder Vickie Gates. ^ "Local Television Market Universe Estimates" (PDF). Nielsen Media Research. Retrieved 2 August 2017. This page was last edited on 24 April 2019, at 05:00 (UTC).